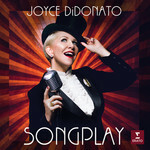 Joyce DiDonato greets you with a song in her heart and twinkle in her eye. The American mezzo-soprano's album Songplay unites world-class musicians from the varied worlds of opera, jazz and tango in the pure pleasure of improvisation, experimentation and exchange. Together they create their own musical language, surprising listeners with timeless melodies transformed and universal stories retold over centuries; songs in English, in Italian and - naturally - in the universal language of music.